It’s getting cold outside, which means one thing: hot chocolate season is here! I love different variations of hot cocoa, and this cinnamon hot cocoa is no different. It has a perfect chocolate flavor with a hint of cinnamon. This recipe is delicious with a little Bailey’s if you want a boozy version. This recipe comes together quickly on the stovetop and is easily multiplied if you’re serving more than a couple of people. Prepare all of your measured ingredients before starting, it’ll make everything go smoother. 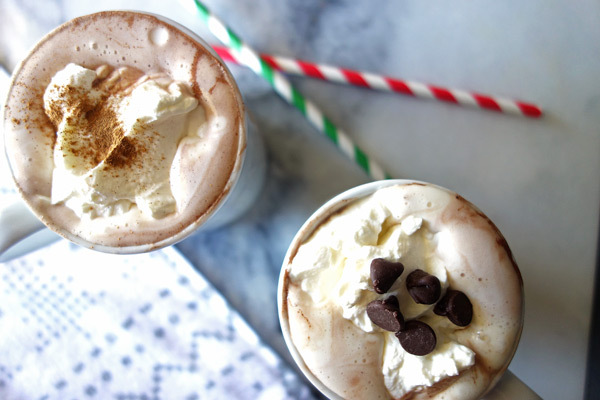 This cinnamon hot chocolate also makes a great homemade gift for the holidays! Just put the sugar, cinnamon, and cocoa powder in a mason jar with directions and a cute ribbon. Easy, thoughtful, and inexpensive! Add the cocoa powder and sugar to the saucepan. Whisk in the milk and heat until boiling, stirring constantly. Turn off the heat and stir in the remainder of the milk. Pour the hot chocolate into mugs. You’re going to top this with homemade whipped cream as the finishing touch. Put all of the ingredients for the whipped cream in a cold bowl and whisk on medium-high speed until soft peaks form. This will take you about 3-5 minutes. Top off the hot cocoa with the homemade whipped cream. Or a few chocolate chips! For more Friday treats, visit The Novice Gardener! Mix sugar, cocoa powder, and 1/2 cup of milk in medium saucepan. Stir constantly with a whisk until boiling. Turn off heat and add in remainder of milk, stirring constantly until completely mixed. Using a cold whisk or a handheld mixer, whisk heavy whipping cream, sugar, and vanilla a medium bowl until soft peaks form. Use immediately or store in an airtight container for up to two days. Just the thing to warm my bones. Kahlua in mine :). Reblogged this on you sent from above.